What if there was a way that you could communicate directly with search engines? 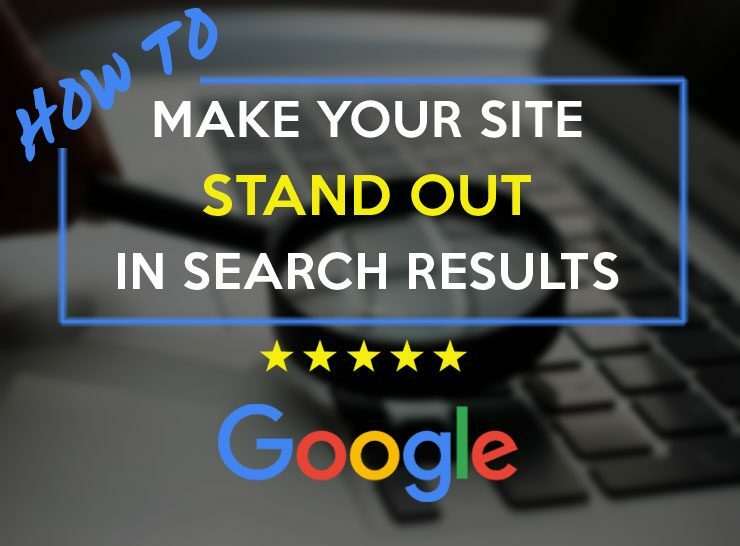 You could help Google understand your content and give them more information to make your website stand out in the search results. 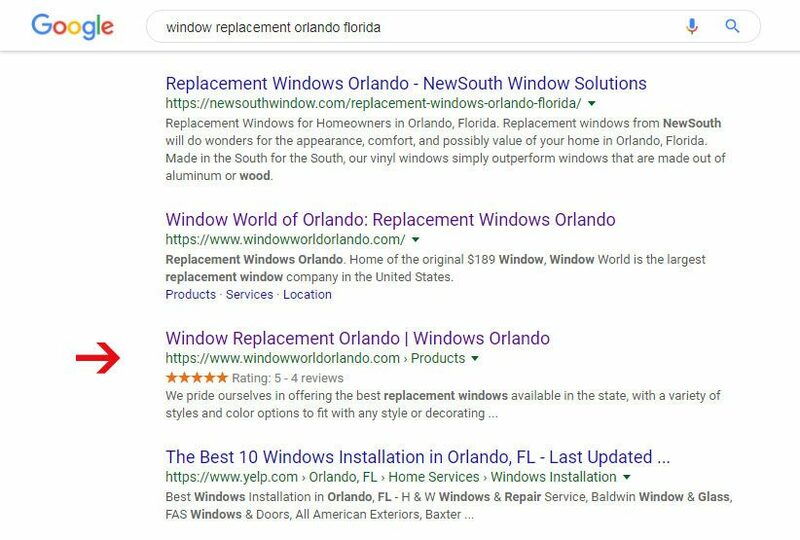 Adding Structured Data to your website will help you tell search engines more details about your content. Have you searched for a product or a service, and noticed some results have star rating? Doesn’t it catch your attention? Have you searched for an event and seen some of the results show multiple events listed under the link? Have you searched for a recipe or a product and saw the results display an image, star rating, cooking time? You can include markup (behind-the-scenes code format) in your website to help search engines understand and display better results. There are many data types you can markup, such as job postings, products, courses, books, articles, videos and many more. For the latest list of data types with examples, see Google’s Reference. Sometimes you’ll hear Schema and Google Structured Data used together. Schema is like a specific vocabulary that all search engines agree to follow. We don’t see it on the front end, but search engines see schema markup in HTML code and use it to display the results. What does Schema markup look like? How do I install Schema in my website? Schema.org provides documentation and resources for search engines to follow. 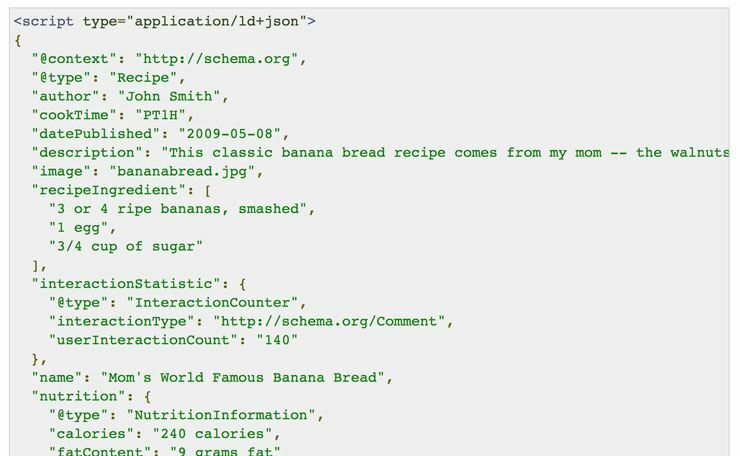 If the page content is marked up inside Schema script, such as Cooking Time, description, image, ingredients, rating, etc, it will be easier for Google to interpret it and make those fields stand out in search results. You can add markup manually or with the help of a plugin. If you want to add it manually, you’ll have to add it to the site pages/templates. Google’s Search Gallery provides code and inspiration for all different data types. Structured Data Markup Helper helps you with the markup if you enter your page URL or copy and paste HTML. 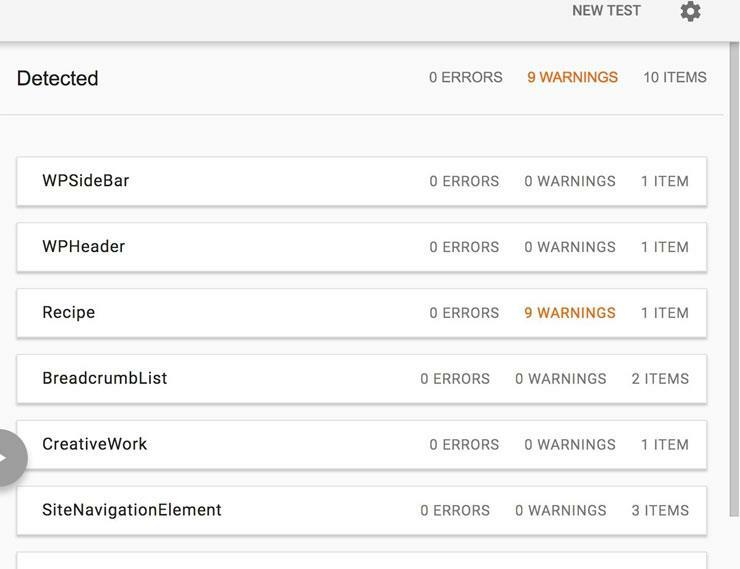 Google has a Code Lab to help you practice adding structured data. Most of the free plugins will add schema, but the options might be limited. 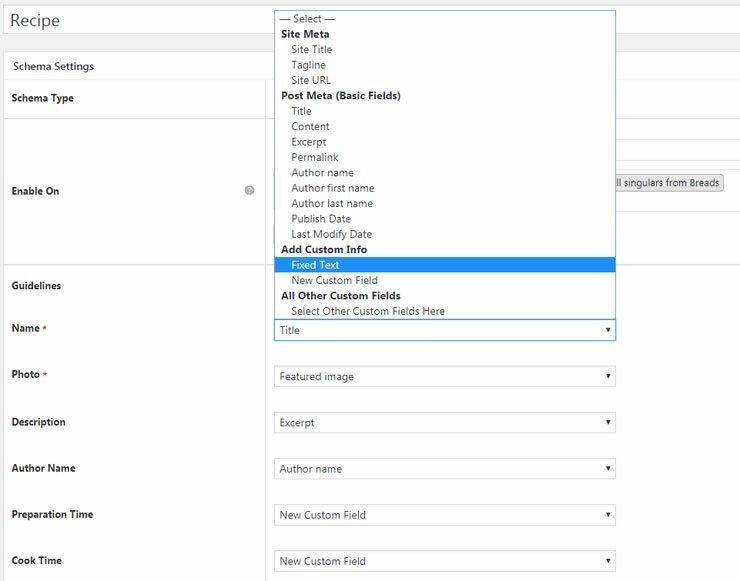 If you have existing content, you’ll save a lot of time by getting a premium plugin that you can customize and use advanced targeting options. I’ll explain those options below. 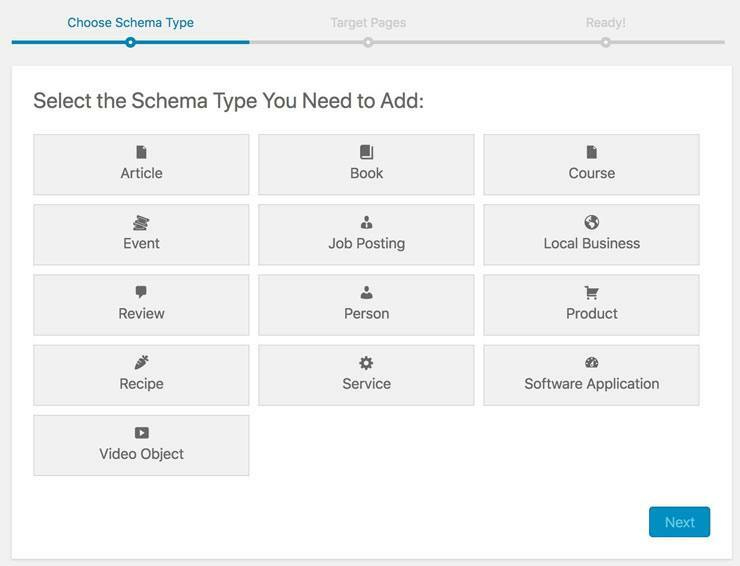 Schema Pro shines by mapping your EXISTING CONTENT to related Schema Fields. 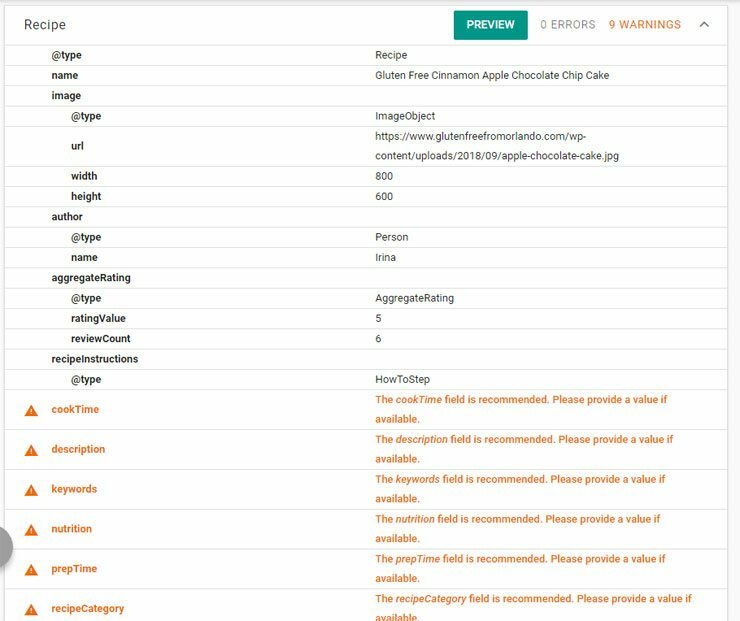 Most other plugins add additional content to the front-end of your site in a form of a review box or other schema details. With Schema Pro, you can map your existing fields in the Settings and there won’t be any difference on the front end of the site. Select to what pages or posts or categories you want to add schema. You can include or exclude pages/posts/categories. Schema Pro points out which fields are required and which ones are optional. For example, a Recipe requires image and name, but cook time, description, calories, rating, etc are optional. It’s important to have the required fields filled so that Google does not flag it for errors. Also Schema Pro has a button to Test Schema on every page/post where it’s set. It makes it easy to see if you filled in all the required fields and if there are any errors. Read below how can you tell if schema is working. Custom fields can be mapped to schema data types. For example, if you have custom fields for Recipe, cooking time, calories, etc., they can be mapped to corresponding Schema fields. You can map fields at once, such as image, title, author, rating, etc. to corresponding fields in your pages/posts, and the plugin will map them for all targeted pages/posts, so you don’t have to enter it individually. You can set schema for only front page or for about us page, or any other page, and you can set it only to posts within a certain category. This is a powerful feature so that you don’t have to restructure your site. For example, if you have 2 categories for your blog – recipes and restaurant reviews. You can only set schema for the recipe category, so that restaurant reviews posts are not included. Yoast SEO is a popular plugin used on many WordPress sites to help with Search Engine Optimization. Schema Pro plugin disables some of the features which come with Yoast SEO plugin. Price: Schema Pro costs $79 to use on unlimited sites for one year of support/updates. There is also an option to purchase a lifetime license for $249. 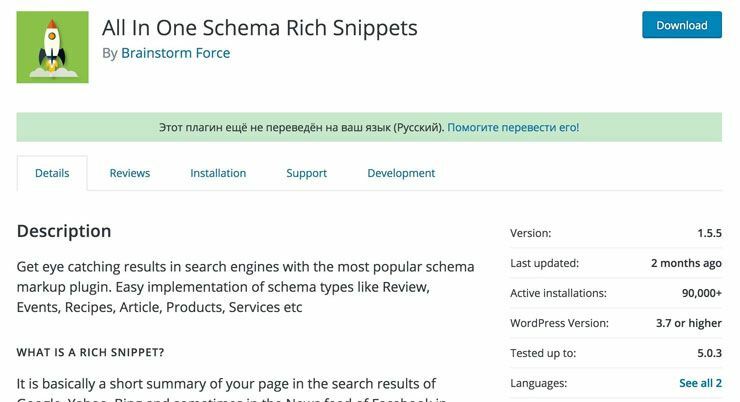 All In One Schema.org Rich Snippets is a FREE version of Schema Pro. 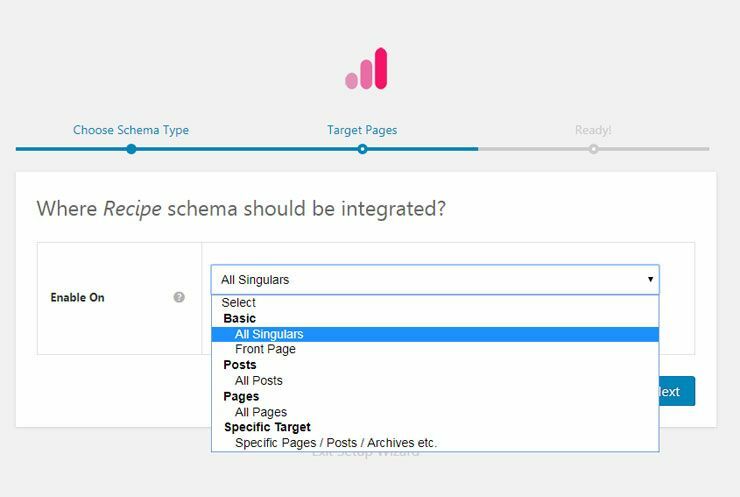 With All in One Schema.org Rich Snippets plugin, you will be able to configure schema for up to 8 data types and enter it manually for each post/page individually. There will be no targeting rules and the Schema boxes will be visible on the front-end of your site. If you want a simple way to add data manually to a variety of data types, install All In One Schema.org Rich Snippets. How Do You Know If Your Schema Is Working? You can’t see it on the front end of your site. How can you see what the search engines see when they crawl your site? Google Structured Data Test Tool is a FREE tool that shows if your page schema set up correctly and if there are any errors. Click on the property to see more details. For example, if I click on Recipe schema, I get more details if there are any errors or warnings. Errors usually flag if you are missing required fields, and warnings flag recommended fields. You can also see if there are any errors with your schema markup in the Google Search Console. Another way you can check if your Schema is working is by activating Google Search Console. If you have any other questions about schema markup, or you’d like to share your own experiences with the options above, let us know in the comments. Web Consultant, empowering business owners through WordPress. Passionate about Web Performance.